Find out how to build a pergola by reading our useful DIY tips, the cost of materials and of hiring a contractor. We also included 4 free quotes. Do you look at your backyard and feel something is missing? Or is the summer season here and all you want to do is sit and relax outdoors as you soak in the beautiful warm weather? The answer to your missing link is pergola. This simple structure can transform your outdoor space into a beautiful place with just the right appeal. It will provide you with the perfect spot for relaxing and entertaining during the warmer season. Not only does a pergola add functionality to your outdoor living space it also adds an aesthetic appeal to your home. A Pergola as is an additional outdoor structure that consists of a framework of vertical posts or pillars that support a roofing grid made of rafters and beams. Pergola originates from an Italian word pergola which simply means projection. In other words, it refers to wood structures mostly in Roman gardens that projected from the outdoor walls and were supported by pillars. Pergolas can be attached to your house on one side while the other side links the exterior wall of the house to the landscape. It can be built as a freestanding structure with four or more pillars/columns to support the roof. The roof is usually flat with cross beams or in some cases; the beams face one direction. The pergolas serve as central meeting or gathering spot for family members and friends. You can make the pergola more practical by outfitting it with outdoor furniture, vines, sheers or clothing to create privacy. You can even enhance it further with lighting. Adding a pergola in your backyard space brings convenience for you and generally adds a distinct warmth to your home. Pergolas can be found in gardens, in the yard and even in the parks. Why Should You Consider Having A Pergola? If you love relaxing and entertaining from your backyard, you need to consider having a functional outdoor structure for your convenience. You need to be able to enjoy the outdoor space and utilize the beautiful warm weather when you get an opportunity. A pergola is one of the simplest structures that you can put up in your backyard. They are not only spectacular but also provide a functional space for you and your family. Here are reasons why you should consider having a pergola in your outdoor space. When the winter season comes to an end, the only thing that comes to your mind is basking in the outdoors and enjoying the warm weather. Unfortunately, the suns rays can do more harm to our skin than good. If you expose yourself to direct sun for long, you might get extreme sunburns and even worse, skin cancer. Pergolas may not provide you with full shade, but they will still shade you from direct rays from the sun. You will be able to enjoy the warm breeze of your outdoor space as you read your book or lounge outside in a comfortable chair. You can add more shade by covering the pillars with clothing or installing climbing vines that have thick leaves and blossoms. Having a pergola allows you to enjoy and spend more time outdoors without risking yourself to health issues. Pergolas are beautiful. They can transform an ordinary looking space to a spectacular view. Since they are open and spaced, you can define your landscape better without creating a crowded and cramped up space. The pergolas are usually built on a ground that is floored with concrete or brick pavers or even over a deck. This flooring together with the pillars creates a serene atmosphere that defines your outdoor space and further enhances your property. So, you and your loved get a peaceful place where you can relax and spend your time chatting over a cold drink as you bond together. 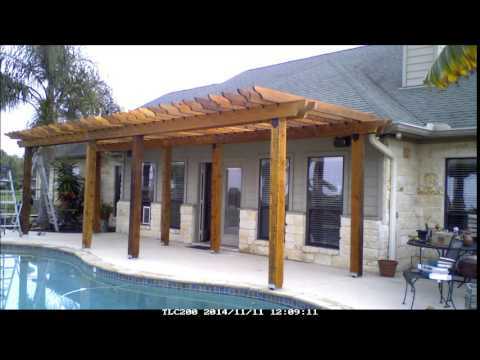 Pergolas are not expensive to build, but the results can be impressive. It’s an affordable way of enhancing your landscape without leaving you with a significant dent in your pocket. They are easy to build, inexpensive and still leave a significant impact on your outdoor space. You can further create a beautiful view by adding climbing plants or vines or cover with colorful clothing to define your style and taste. All these can be done on affordable budget while at the same transforming your dull space into a bright and elegant looking one. Pergolas provide a functional living space for you and your loved ones. It provides you with a space to sit and relax during the hot season. You might be having a deck in your yard, but it might not be so useful on a hot summer afternoon. Adding a pergola to your home becomes like an extension of your living space. You can spend more time outside with the additional protection. Pergolas are structured with columns and pillars which create perfect support for other landscaping features such as climbing vines and other plants with lush leaves and flowers. If you plant these types of flowers and plants next to the pergola, they weave their way on the pillars and spiral up to the roof beams creating a beautiful pattern with a fantastic view. You can also plant flowers in vases and hang them on the pergola to enhance its look and that of the surrounding environment. The ideal plants include clematis, wisteria, and flowers such as petunias and portulacas. The plants and flowers not only create a beautiful scenery but also smell good and fresh. In addition, the flowers and climbing require the normal maintenance and all you will need to is to wind them up the around the columns of the pergola and let the climb their way up. From the above benefits, there is no doubt that adding pergolas in your outdoor living space will make it more beautiful and appealing. The design of your pergola can create a calming and serene effect for your home. It provides a peaceful atmosphere for you and your family to enjoy. Additionally, if you decorate the pergola with plants and flowers, you will have created a distinct visual link between your garden and your home which further enhances your landscape. Pergolas act as focal point in your landscape. When planning to put one, there are several factors you need to put into consideration. Even though the process of building a pergola is considered to be uncomplicated and no so expensive you still need to plan, research and prepare adequately just to make sure you have chosen the one. Here are factors that should not be overlooked by homeowners when planning to put up a pergola in their homes. Before you pick up building materials and get down to the business of setting up a pergola, you need to factor in the available space in your yard. This will ultimately determine the size of the pergola you will build. Most pergolas are about 9 feet by 12 feet in size. However, the size of the pergola will depend on the size of the area you have. It’s essential to come up with a pergola that accentuates and complements your yard instead of crowding it or making it look cramped up. Also, keep in mind that a larger structure will require more framework support which occupies more area. When choosing the size of the pergola, factor in your space, and design a pergola that will not only sit perfectly in your yard but also suite your style and design. Having a huge pergola attached to a small home will look out of place and ridiculous. So, work with your space and set up something that balances your home and outdoors. What do you plan to do with the pergola? Or how will the pergola be used? Generally, a pergola is designed to provide an outdoor living space for relaxing and entertaining. However, some people may put it with plans to do barbecues, or simply to provide privacy and shade while lounging, or as an outdoor dining area. Your reasons for building the pergola will greatly determine its design and size. For example, if you want a pergola that will provide shade, then an open roof pergola may not work for you. Similarly, if you plan to use it as barbecue area, the choice of material will not be the same as the one designed for relaxation and sitting purposes only. You might have to consider not putting a full coverage if you plan to be cooking from the pergola to avoid trapping smoke inside. Therefore, putting these factors into consideration, you should try and establish how much privacy you need, shade and maybe fireproof and soundproof materials. When doing any major additions to your home, it’s always important to check with the local city building department to find out if you need a permit or approval for the addition. Although in most cases pergolas do not require any form of permit or approval as they are not considered as major outdoor buildings, it’s essential to follow up. Some states and regions have strict regulations and restrictions where certain planning codes have to be met. For example, a homeowner’s association may have limitations on outdoor colors and style. Other states have codes that restrict outdoor electrical wiring. It’s always important to check for any restrictions and limitation before building a pergola. This way you will save yourself the cost of making adjustments or having to tear some things down later. One of the most costly errors you can make when building a pergola is not inspecting the area where you will place your pergola. You have to make sure that you have inspected the ground just to be certain that there is nothing that can get damaged once you start digging the posts or pillar holes. It’s vital to know where electrical, sewer and water lines pass before you settle on a specific location for your pergola. It could be very costly if you interfered with any of these not to mention the disruptions and inconveniences that will follow. To avoid this kind of mistakes, make sure you call the utility companies before you do any digging. They will come and mark the lines for you, and you can proceed with your project safely. This service is usually free, so make sure you call and save yourself significant losses. When it comes to pergolas, you have an endless choice of materials. All the materials you can use have their advantages and a downside as well. The pergola materials include wood such as cedar or redwood, vinyl, aluminum for the supporting posts, fiberglass, etc. We will discuss the various materials further in this guide. However, it’s critical to note that the choice of building materials will significantly depend on your budget, maintenance and also their lifespan. No one wants a dull structure erected on their yard. A pergola is not only meant for practical and functional purposes only, but it’s also designed to enhance your landscaping. When designing, think about a shape that will bring out the view of the pergola better. Consider accessorizing your pergola once you are done with the basic set up. You can brighten the pergola with LED lights installed in a decorative pattern. Plants and flowers will not only bring color and beauty but also maintain a fresh fragrance for your outdoor living space. The climbing vines provide shade, privacy and also create a visual link from your pergola to your garden. You can also opt to add outdoor sheers or blinds and screens. If you want to create a clear view of your backyard, you can go for the clear blinds, or you can define your style with colored mesh curtains. When it comes to accessorizing your pergolas, the choices are limitless, and there is no reason why you should have a plain looking structure. This is also another important factor to consider. Pergolas can either be attached to an existing structure, for example, to the exterior wall of your house. Or, they can be built freestanding n in your yard. The choice will entirely depend on your preferences and what you intend to do with the pergola. If you want it as an extension of your home, then you can attach it to your exterior wall. If you want it to serve as an excluded outdoor relaxing area, then you can build freestanding one in your backyard. If you choose to attach it your house, you need to carefully consider the architectural detail and designs, and the location. Are you handy enough with building skills? Do you have time to spare on a free weekend? Even though putting up a pergola is a relatively uncomplicated task, you still need to be skillful and dedicate a considerable amount of effort and time. If you feel you are up to the task, you can assemble the materials and proceed to build one by yourself. You can research online for pergola plans and materials needed and read more on the appropriate dimensions. However, if you do not have time to spare for the task, you can buy the DIY kits, or you can hire a professional to build the pergola for you. The DIY kits come pre-cut with the necessary tools and wood structures. The posts, beams, rafters and the wood are usually pre-cut. The kits have installation instructions step-by-step with illustrations and detailed photos on how to go about each stage. Since the kits have already been cut for you, you do not have to worry about getting the dimensions or measurements wrong. If DIY is totally not your thing, you can hire a professional to avoid doing a shoddy job that may cost you future repairs or not come out as you had planned. A professional will deliver on your expectations in a short period. If there are permits to be obtained, a professional will know how to go about, and it could save a lot of hassle. In the end, you should do your math and consider your budget before you decide on whether to hire or DIY. Perhaps this should be on top your list. Your budget will determine the size of your pergola, design, materials, accessories, and if you will be able to hire or DIY. Remember it takes money to accomplish anything, so when building a pergola, a budget isn’t an expiation. Figure out what you want to achieve in line with your budget. Be realistic to avoid going overboard. Somethings can be added at a later date if the budget does not allow, so don’t stretch your savings unnecessarily. If you put these nine factors into consideration before building your pergola, you will have an easy time when the actual work begins. Nothing beats proper preparation, and if you want to have a hassle-free home improvement project make sure you prepare, plan, budget and research beforehand. Pergolas can be built using different types of materials. The choice of building materials will significantly depend on your budget, the size, the lifespan of the pergola and most importantly your preference. Here is a list of a selection of various materials that you can use when building a pergola. The beauty of wood is that it can accommodate any design you want, whether free-standing or the ones attached to the walls. Wood being one of the commonly used materials for pergolas, it offers a natural and elegant look for your landscape. In some cases, some people opt to paint over the natural wood to make it more exciting and appealing. The wood option comes in various categories whereby some of them are considered long lasting and ideal for outdoor structures, in this case, pergolas. The most commonly used type of wood for pergolas include redwood, teak or pie, cedar, and mahogany. Some types of wood are resistant to rot, fungi, insects, decay, shrinking and warping. However, wood requires maintenance and sealing to protect it from adverse weather conditions such as rain. Sealing also reduces chances of cracking and chipping and defines its look. Cedar – you can opt to use red cedar, a reddish-brown wood that turns silver grey with age. Even though this kind of wood splinters it is known to hold to weather conditions such as rain, heat, sun, and cold really well. You can stain it to add some character to your pergola. Ipe – this a South American hardwood which is considered to the best type of wood to use for outdoor structures such as pergolas and decks. Ipe is resistance to rot and bugs. This type of wood is hard, thick and heavy making it most ideal to use with slate or stone surfaces. Redwood – just like cedar, this kind of wood is soft and turns grey with time. If exposed to the sun for a significant period, the wood turns to black. Redwood is resistant to rot. You can use a sealant on the wood to enhance your pergola and make it more appealing. Mahogany – one of the best wood to use when building a pergola. Is resistant to rot and pests and has a tight grain. When it ages, it becomes silvery grey. You can also give it a beautiful finish by treating it with aquatic oil. Fiberglass pergolas are considered sturdy and lightweight. They require minimal maintenance, and no matter how long they stay, they do not sag. They are easy to paint, and because they are strong, they can be used to build a relatively bigger pergola. Fiberglas pergolas are not so common in most homes making them a bit expensive as compared to other options such as the wooden ones. For homeowners who prefer a modern and sleek style, metal can be the ideal option. Metal provides flexibility, and it’s more robust and resistant to weather conditions compared to wood. The metal option is more versatile and can fit into different designs, whether freestanding or attached. The metal pergolas are also considered to be one of the easiest options to install since they come pre-cut. They are also ideal if you are planning to build a rather big pergola. The only drawback with metal is rust. You will need to take proper measures to protect the metal from rusting. This means you have to seal it with the right sealers and galvanize it. Steel – Steel makes some of the sturdiest pergolas. You can easily attach curtains and blinds to steel frames to add more shade to your pergola. They have a resilient framework that ensures that the curtain fabric holds well and stays in its place. They make an excellent option for accommodating garden plants. You can wrap the climbing vines around the beams and create a more natural flowing look especially if the plants have lush leaves. Aluminum – this is one of the most cost-effective ways to build a pergola, if you are working on a tight budget, aluminum is the best way to go. Aluminum pergolas also require minimal maintenance. They are non-porous which means that they won’t weather or rot. These types of pergolas are easy to install making them ideal for DIY projects. Since the beams are not heavy, you can easily install them without professional assistance. Aluminum is ideal for building an attached pergola. This also one the ideal material to use when building pergolas. It requires little maintenance. If you use a thick PVC material, you will not get issues that are common with metal or wood options. If you are keen on matching your house’s façade with the pergola especially if you plan on attaching it, the brick or stone option can be an ideal option. There is no disputing that pergolas are beautiful and practical additions to outdoor space. If you are planning on building one you need to know the various materials that you can use and the costs involved. The cost of building will depend on non materials used, the size of the pergola and if DIY or hire a professional. Here is the breakdown of materials that can be used to build a pergola, their cost and cost of labor where a professional contractor is involved. Please note that the price estimates are based on a pergola size of the 10x 1l0 foot. Building pergolas can be an easy DIY project. 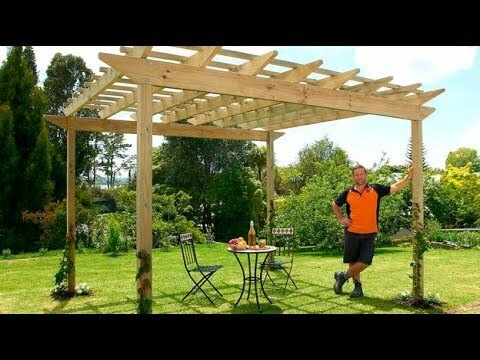 This guide will give you step by step procedure on how to construct a pergola. You can use the pre-made kits for installation, or you can construct the pergola from the ground yourself. Pergola kits-these are ready to assemble kits that consist of precut wood/lumber and hardware. The kit comes with pictorial instructions on how to carry out the installation. If you feel you don’t have enough carpentry skills, the pergola kits are ideal for you. They are also a better option for those with a limited budget for they are cheaper and affordable. 10×10 foot pergola kits cost about $1500 to $2000. However, the prices vary depending on size and design and the type of kit. For example, the aluminum and fiberglass kits cost more as compared to the wooden options. However, these kits are relatively easy to install and affordable. Building your pergola requires time, carpentry knowledge and adequate planning. You will need to buy the necessary building materials, plan your time and also pick the most suitable site. Averagely, the cost of building a pergola comes to about $3000. Before you start building you need to pick the ideal site for your pergola. Remember, a pergola is supposed to enhance and define the style and character of your garden. So, when deciding on the site, pick a focal point that will best reflect and complement the pergola. Also, keep in mind that the size of your pergola will depend on the size of the available area, so if you are planning to build close to your house, you should plan accordingly. It’s also recommended that you build your pergola near trees for extra shade. Even though a pergola provides you with shade, it’s minimal because the roof beams and rafters may not shield you completely from the summer sun. Still on the subject of the site, make sure you pick a flat and level area. If your preferred location is not flat, you can grade it to the right level by removing soil and then tamp the area to level it. Measure the area of your base using stakes and strings. Make sure that the measurements are similar by measuring all the sides. Before digging any holes, it’s advisable that you call the utility company to identify sewer, water, and power lines to avoid causing damages and disruptions. They will come and check if there are underground services on your location. Once they clear the area, you can start digging the post holes. The hole should be two feet in depth for an 8 feet tall structure. The depth of your holes should always be ¼ of the height of the pergola. Ensure that the diameter of the post holes is twice the width of your pillars. At this stage, you need to set the posts in the dug holes. First, you need to confirm if the post is aligned using a 3-foot level. Using stakes, brace the holes. Make sure they are secure. Once you are sure, you have firmly secured the posts, prepare your ready mix concrete to fill in the holes. You will require around four to six bags for each hole. The amount of concrete will depend on the size of the postholes. Get a wheelbarrow and pour the ready-mix powder and then add some water slowly as you mix. A 40 – pound bag will require around six gallons of water, but you have to be cautious not to use too much water. Using more water than required can weaken the concrete. Once the concrete mixture is ready, you can now fill the holes. Fill the concrete to an inch of surface to give it room to expand and contract in case of weather fluctuations. Keep churning the concrete as you fill the holes to remove air pockets. Allow the concrete to sit for 48 hours. As the concrete posts continue setting, start preparing the support beams and rafters for your pergola. Normally, the beams are attached to the posts which ideally carry the whole weight of the pergola. The pergola requires around two to four beams on all sides, and the rafters are attached to the top of the beams. Cut the beams to the right length. It’s also good to purchase the precut beams and rafters to make your work easier and also to ensure you get the right size. You can trim the ends into your preferred decorative designs. Once the concrete in the postholes is ready, you can proceed to install the beams and the rafters. Ensure that your pillars are level before you secure the beams. Finally, add the rafters on top. Ensure that the rafters are well spaced in an even manner. Once you have aligned everything perfectly, you can use 8-inch galvanized screws to secure the beams to the posts. You can choose to enhance you pergola further by either painting or staining. Building materials will affect the total cost of putting up a pergola. For example, if you opt to use exotic wood you will spend more per square foot as compared to other standard materials. Similarly, if you use redwood expect to spend twice the amount you would if you had used pressure treated pine. Materials such as vinyl and aluminum are very cost friendly, and they are among the options with the lowest cost. Some materials require regular maintenance, while others are sensitive to the harsh weather conditions. Therefore, when selecting pergola building materials, consider these two factors. For example, to maintain the natural appeal of wood, you will need to seal it to prevent it from graying. The size of your pergola will determine how much material you will need. It goes without saying that the bigger the pergola, the more material you will need. If you are hiring a professional, you will have to factor in the cost of labor. Generally, pergolas can either be open- air or have a slatted roof, so they do not require a lot of materials. But, if you are building a bigger pergola, you will need more materials which can affect the overall cost. If you are not a DIY enthusiast or you do not have time to spare to build the pergola yourself, the cost of labor will influence the overall cost of putting up a pergola. A professional may charge per square foot; this will include the cost of materials, labor and the size of the project. The average cost per square feet comes to about $20 to $50 depending on the type materials used. This means that it will cost you more to hire a professional to build a pergola as compared to DIY. Generally, pergolas are simple structures that can take a weekend for a DIY enthusiast to put up. In fact with proper planning, building a pergola by yourself can turn out to be an exciting venture. Most of the building materials can be purchased in home improvement stores. In addition, a DIY pergola building will save you a considerable amount of money. For example, hiring a professional to build a pergola will cost around $3500. If you opt for DIY, you can slash this amount by almost half depending on the choice of materials. However, to some people, DIY may not be an option especially if you have a busy schedule. In this case, you may have to look beyond the price tag. Here are some of the factors that make hiring a professional sensible in some situations. If you look at factors like the available time, you might have to reconsider. How much time will you need to complete the project? Do you have it? Sometimes, time might seem like it doesn’t cost you real cash, but for someone who is busy, it is actually valuable. Even though building a pergola is not a complicated task, you still need a good number of tools and materials even if you are installing the pergola kit. If you do not have the necessary tools, you will have to purchase or rent them which adds to the total cost of your project. Any construction project, no matter how simple it seems to be, it can be risky especially for a novice. If you feel you do not know how to handle and use tools then its good idea to involve a professional. Injuries are not something you want to deal with in the long run; they can actually be expensive. Hiring a professional for your pergola may cost more, but you will be assured of knowledge, skill, and experience. A professional will deliver the custom design for you, and you will be assured of quality since they have to maintain their reputation. Moreover, professional will get the necessary permits and follow the right building codes where necessary especially when dealing with electrical features. On the other hand, DIY can be fulfilling and cost-effective. You will take your time to build a pergola that best suits your needs. If you are doing it with your loved ones, it can be a great way to bond. Weigh your options and settle for the approach that works best for you. Whether DIY or hiring a professional, the results will be a beautiful structure that will fulfill your outdoor needs. A pergola does not require too many repairs or costly maintenance routine. In fact, maintaining your pergola is easy and is something you can do effortlessly without taking too much of your time. Chips – sometimes the wooden pergolas can chip with time. If this happens, you can use wood putty to repair the areas that are chipping. If the wood is painted, you can sand it and then repaint over. Sagging and rotting – this is common with wood pergolas. The beam and rafters may rot or sag as they age. If this happens, inspect to see which beams or rafters are sagging or rotting and remove them. Replace them with new ones. Leaning over time – if this happens, pull the pergola using ropes and stakes and level it back. Alternatively, you can dig around the base of postholes and attach braces around the perimeter to secure the posts firmly, on top and bottom. However, if the posts seem weak and the leaning is extensive, you can call a professional to repair to avoid the risk of the pergola collapsing on you. Vines – you can plant climbing plants and vines around your pergola. As the vines grow, you can train them and wrap them around the pillars. The lush leaves and blossoms add beauty and shade to your pergola. Curtains/blinds – you can create some privacy by adding curtains or sheers around the pergola. The sheers can define your style especially if you use a color that enhances the beauty of the pergola and your landscape. Covers – sometimes you might need more shade and protection from direct sun as you relax outdoors. You can install a retractable cover over your pergola. Swings – you can make the pergola more fun by installing porch swing between the posts. It will make it the perfect spot to relax as you enjoy the warm afternoon weather. Building a pergola in your outdoor space increases the aesthetic appeal, enhances and defines your home, and increases the value of your home. It adds up as a landscaping feature in your yard or garden and creates a focal point for our home. In short, a pergola is an outstanding decoration in your garden or yard. Aside from the aesthetic value, a pergola provides a practical spot for relaxing and enjoying the warm weather. They can either be freestanding or attached to the exterior wall. They can be built with various materials depending on your needs. If you want to create a warm and inviting view of your home, a pergola is an ideal addition.